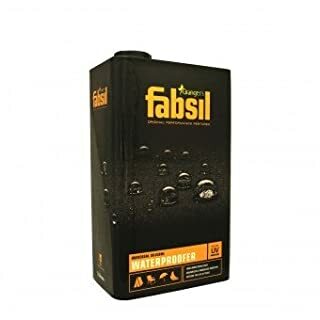 This product is designed to be used on fabrics exposed to the elements for long periods of time Fabsil Gold is a highly-concentrated waterproofing treatment perfect for use on equipment such as awnings, marquees, and tents. 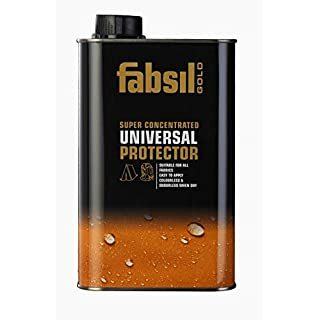 With 5 times more silicone packed into it, Fabsil Gold works great on items that see more than their fair share of wet weather or water - including boat covers and sails. 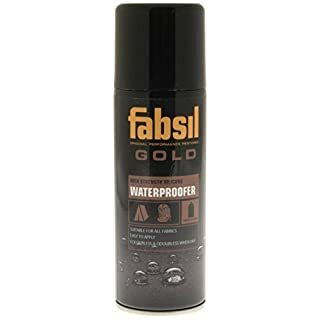 Easily applied, Fabsil Gold will last longer than other waterproofing treatments, and offers unrivalled levels of water-repellency. It will bond to a wide range of fabrics including canvas, cotton, polyester, and nylon producing a strong, waterproof barrier against rain. The UV treatment will prevent fading and fabric degradation caused by UV rays. 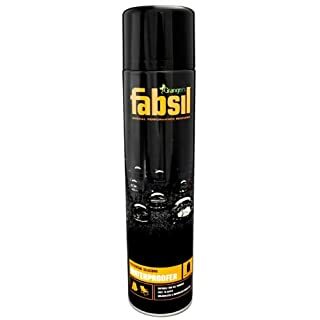 Features Suitable for all fabrics Extends the life of products Colourless and odourless when dry Easy to apply Made in England 5 Liter Fabsil Gold Clothing Tent Spray Fabric Waterproofing High Strength This product is designed to be used on fabrics exposed to the elements for long periods of time Fabsil Gold is a highly-concentrated waterproofing treatment perfect for use on equipment such as awnings, marquees, and tents. 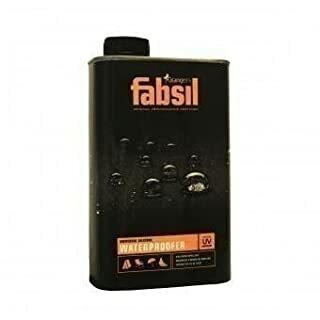 With 5 times more silicone packed into it, Fabsil Gold works great on items that see more than their fair share of wet weather or water - including boat covers and sails. 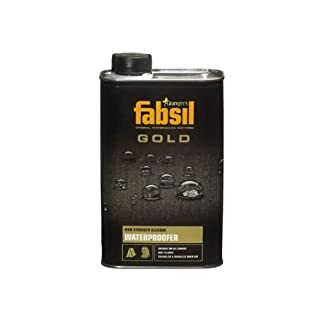 Easily applied, Fabsil Gold will last longer than other waterproofing treatments, and offers unrivalled levels of water-repellency. It will bond to a wide range of fabrics including canvas, cotton, polyester, and nylon producing a strong, waterproof barrier against rain. The UV treatment will prevent fading and fabric degradation caused by UV rays. 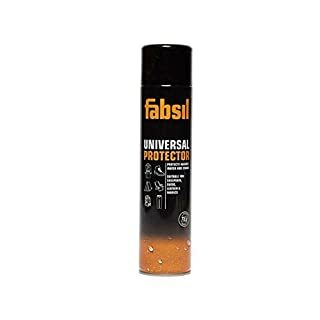 Features Suitable for all fabrics Extends the life of products Colourless and odourless when dry Easy to apply Made in England Note: Grangers International has stopped selling 5L gold pack however we will send you 5 cans of 1L. 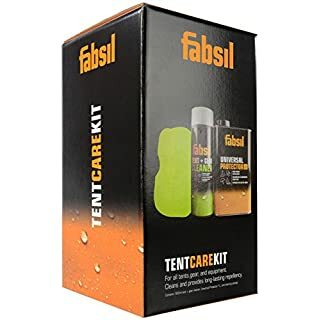 Highly effective silicone-based water repellent treatment for all kinds of outdoor kit. 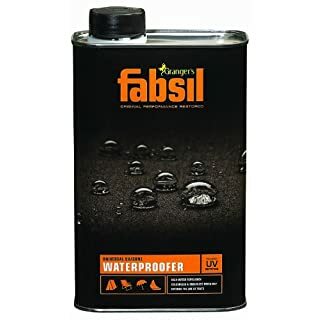 Grangers Fabsil is a highly effective silicone-based water repellent treatment for all kinds of outdoor kit. It will bond to a wide range of fabrics including canvas, cotton, polyester and nylon to produce a strong, waterproof barrier against rain. The UV treatment will prevent fading and fabric degradation caused by the sun's UV rays. 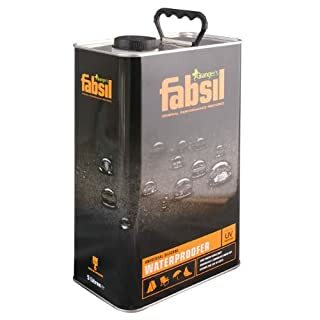 This large 5 litre can for brush-on application is ideal for tents, tarpaulin, canopies awning fabrics and fabric outdoor furniture. 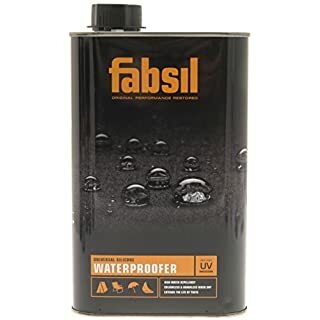 High Water Repellency Colourless and Odourless when Dry Extends the Life of Tents 5 Litre Can Brush-on Application Fabsil is unsuitable for painted leather, glued seams and plastic-coated fabrics including mudwalling, groundsheeting and vinyl windows. 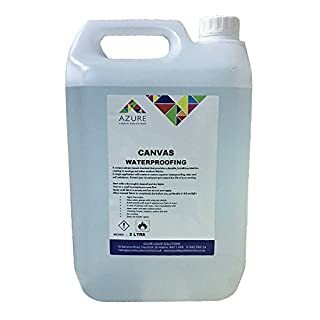 Application: 1 Litre of Fabsil will cover approximately 18 sq metres of nylon, 7.5 sq metres of lightweight canvas or 5sq metres of medium weight canvas. As a rough guide, an average lightweight 2 person nylon tent is approximately 6 square metres. 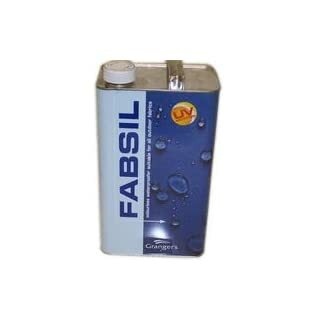 Fabsil is a silicone-based water repellent treatment that will reproof most absorbant synthetic materials whilst also adding UV resistance. Supplied in 600ml bottle. 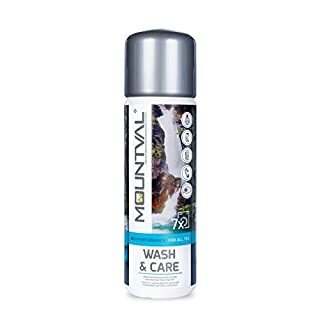 This product can give a new lease of life to most waterproof garments. Grangers Fabsil Gold Aerosol (200ml)High strengthAerosol silicone prooferEffective on all fabricsHigh strength silicone-based water repellent treatment for all kinds of tent, tarpaulin, canopies and awning fabrics. Spray application, dries to an odourless and colourless finish. 2. 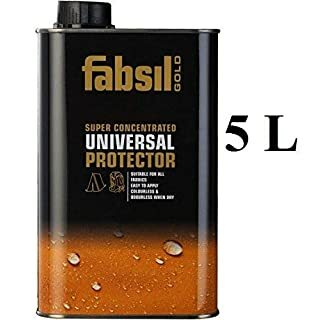 5L of top quality Grangers Fabsil. Has your tent, awning or canvas sprung a leak? Want to keep dry? 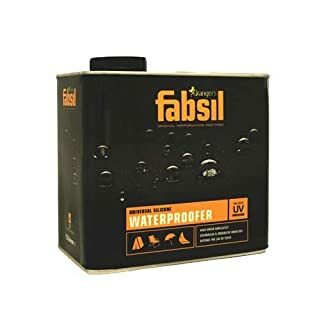 Use Fabsil waterproofing sealant on your tents, awnings and canvases to provide a water tight seal against rain. Canvas Waterproofer Soft Top / Convertible / Awning Tent 5 Litre Replicates the original water-repellent finish applied to outdoor products. Helps keep you dry in even the wettest weather. Suitable for use on tents, boat covers, convertibles, canvas car coverings. A unique solvent-based chemical that provides a durable, invisible protective coating to awnings and other outdoor fabrics. A single application will create or restore superior waterproofing, stain and soil resistance. Protect your investment and extend the life of your awning. Start with a thoroughly cleaned and dry fabric. Test on a small inconspicuous area first. Spray until fabric is evenly wet but do not over apply. Allow treated fabric to completely dry before use, preferably in sun sunlight.